The semiconductors that act as the brains for everything from our washing machines to our mobile phones are hitting a variety of plateaus — plateaus that could affect their ability to perform faster, longer and in more and more places. But electronics makers might find some short-term answers to these problems by looking at the supercomputer industry and chip researchers could solve the long-term issues by studying quantum physics. While it seems that chip industry has changed a lot in the last five years or so, that’s nothing compared to what will have to happen going forward. In the last five years the advent of iPhone — which brought real computing on a small, mobile form factor — has upended Intel’s dominance in the PC market. Just last week mobile chip maker Qualcomm (s qcom) surpassed Intel (s intc) in market cap. And on the server side and in high performance computing, the demand for more performance in a more efficient package has led to the adoption of new accelerator chips. The Top 500 list of the world’s fastest supercomputers came out Monday and showcases this trend with 62 supercomputers on the list using an accelerator. The fastest computer, called Titan, contains a mix of x86 chips and graphics processors to reach speeds of 17.59 petaflops. It was only four years ago that a GPU-powered computer had even made this list. To drive home the point that the x86 processor just isn’t able to compete on performance per watt of power consumed, Intel itself today said its new Xeon Phi architecture was shipping, and that it had a spot on the Top 500. 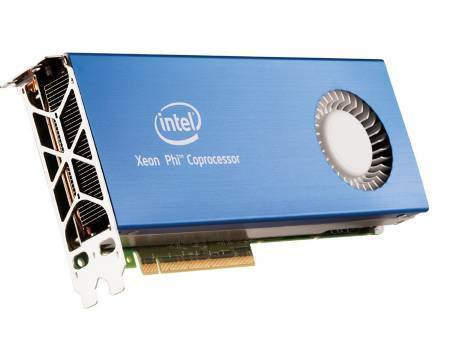 The Xeon Phi chips employ a co-processor wedded to the standard x86 Intel chip. Intel isn’t beating the point home, but this is a heterogeneous architecture that other chip companies have been pursuing forever, and Intel’s effort to boost performance without abandoning its own x86 architecture. Already the mobile industry uses a mix of cores to divide different processing jobs on a mobile device as a way to send the right job to the right processor, but also to save battery life by turning cores off when not in use and using a lower power core if possible for a job. But accelerators can only take the chip industry so far, and are aimed at the high performance computing market. A multipetaflop machine still consumes a lot of power. One way to reduce that power consumption and boost performance is to cram more transistors on a chip by shrinking the space between transistors and reducing the overall size of the chip. This is called moving down the process node, but as the chip industry approaches feature widths of 20 and 14 nanometers, manufacturers are resorting to ever more complicated structures and materials to ensure that the chips perform well. The “quantum weirdness” changes the way the current flows through a channel and so far those changes behave in unpredictable ways because the particles researchers are working with are at the atomic or sub-atomic scale. Which relates the research the top-level chip guys are doing to quantum theory and Schrodinger’s Cat. While Schrodinger’s famous thought experiement is an effort to articulate that the act of observing a quantum particle may change its state, the thought experiment is based on the fact that at subatomic scale materials behave differently. As feature sizes in future chips shrink to the level of atoms, the resistance to current no longer increases at a consistent rate as devices shrink; instead the resistance “jumps around,” displaying the counterintuitive effects of quantum mechanics, says McGill Physics professor Peter Grütter. This means that as chipmakers develop smaller processors or build any electronics with nano materials, the laws of physics will demand they change their materials and likely the structure of those materials, as well as conduct basic research to understand the new rules of playing at the atomic scale. Fortunately scientists at universities and researchers inside labs at place like IBM and HP are thinking about quantum physics and how it will change the rules of semiconductor manufacturing. And yes, there are some that are skipping the electronics part of the equation and skipping straight ahead to quantum computers, but I think our digital bits are here to stay for a few more decades. Schrodinger’s cat image courtesy of Wikipedia. High performance computing will become everyday computing once application coders adapt to heterogeneous massively parallel programming. It will also require a new level of algorithms to be used. But imagine the average person being able to access unfiltered government spending data in graphic format, unbiased analysis of communications plan rates, insurance rates, investment information from open-sourced, public-activist groups who want to boot brokerage thieves out of the businessâ€¦The possibilities are endless with affordable PCs in the teraflops range with adjunctive intelligence software written by a new generation of programmers. Youâ€™re not looking at the broad picture of exponential technological advance. But doesn’t disinformation increase in proportion? At least that’s my experience on the net. The theory of schrodinger’s cat improperly explained.please correct.